Marlien Van Heerden, a South African artist, considers herself fortunate to be able to express her passion for art on a daily basis. 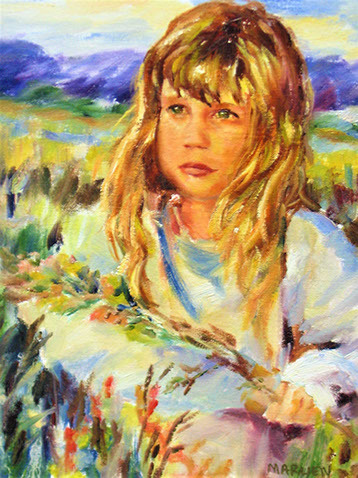 Her artwork often features a variety of overarching themes: small children and old men, serene landscapes to drill rigs at sea. Her love for painting people, the crown of creation, is evident throughout her artwork. Her paintings capture a moment in time: the last rays of sunshine disappearing over the horizon, a man lost in his own thoughts amidst the bustle of a crowd, friends bonding over a shared moment; unique combinations of gestures, postures, and facial expressions. Marlien was born in 1969, the youngest of five children. She grew up in a rural farming community, and studied marketing at the University of Pretoria. 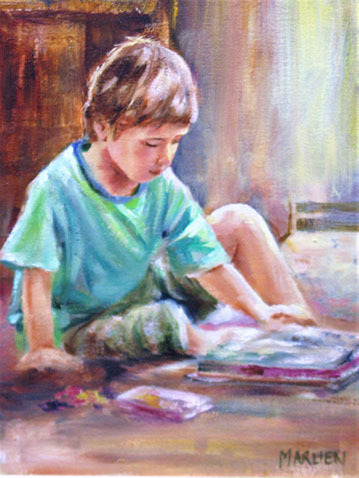 She began painting on a full time basis in 1997 and lives in Pretoria with her husband and their four children. She is always on the lookout for unique moments that can be captured on canvas. Marlien enjoys working from real life scenes, and because of this started a group of ‘plein air’ artists who gather once a month to do outdoor painting.